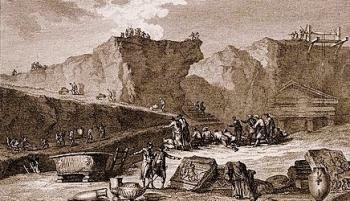 and early excavations, both famous & infamous, of classical antiquity in Naples. From this modern archaeological point-of-view, many say that the original excavations at Pompeii and Herculaneum, performed under the Bourbon dynasty in the mid-1700s were a disaster. In the very early 1700s, slightly before the arrival of the Bourbons, the exact locations of Pompeii and Herculaneum were still unknown. That changed in 1709 when one prince D'Elbeuf, a French nobleman in Naples in the service of the Austrian army, [Naples was an Austrian vice-realm at the time] looking for a site to build a villa (now called the villa d'Elboeuf), heard that some farmers had found a number of marble slabs in the ground, just there for the taking. D'Elbeuf bought the property and started digging for building material and dug down right into the theater of ancient Herculaneum. He then plundered it, taking no note of the original location of objects and even indiscriminately breaking objects that he considered of no value. Fortunately, two things stopped him: Vesuvius erupted and the Spanish Bourbons wrested control of the kingdom of Naples from the Austrians. This man [de Alcubierre], who (to use the Italian proverb) knew as much of antiquities as the moon does of lobsters, has been, through his want of capacity, the occasion of many antiquities being lost... [Cited in Stiebing, below]. In 1748, de Alcubierre then heard of other ruins further to the east and went digging. He thought he might have found the ruins of Stabiae, but inscriptions found in 1763 showed that the ruins were indeed the fabled city of Pompeii. De Alcubierre's team essentially "cleared" what they could, not wantonly destroying objects, but simply, in modern terms, "treasure hunting." The modern approach to archaeology came along in the person of Karl Jakob Weber (1712-1764), a Swiss architect and engineer, who joined de Alcubierre and who insisted on drawing diagrams of everything and noting where each artifact was located. He so irritated de Alcubierre by his insistence on scholarship and precision that de Alcubierre (at least, this is one story) paid his own men to sabotage the timbers shoring up Weber's digs, hoping for a cave-in. Weber's work is historically of monumental value: as one example, he discovered and saved for future generations the first ancient library ever found, containing the famous Herculaneum papyri. It was largely through his efforts that the rest of Europe became aware of the physical remnants of classical antiquity in southern Italy. It is a thousand pities that the site was not excavated methodically by German miners, instead of being casually ransacked, as if by brigands, for many noble works of antiquity must have been thereby lost or ruined. 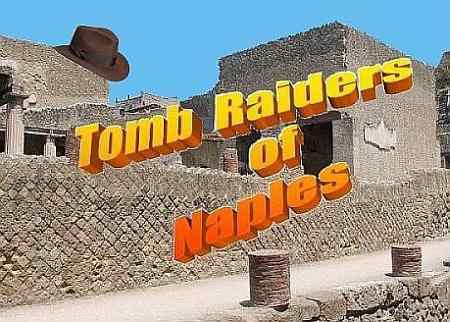 That is somewhat the tone of northern Europeans who looked at southern Italian archaeological sites. This includes Sir William Hamilton, who prided himself on being a careful collector and preserver of antiquity, but who also shipped copious amounts of antiquity off to England, illicitly and over the objections of Bernardo Tanucci, the Neapolitan Foreign Minister. Those artifacts that were not lost at sea (!) now comprise the Hamilton Collection in the British Museum. (There is a separate entry on William Hamilton at this link.) Through all of this, the stocking of museums-to-be from that period seems to be driven by a certain arrogance of power, as if the English, Germans and French (during Napoleon's campaign in Egypt) were somehow convinced that the by now totally decadent southern Mediterranean peoples didn't really understand what treasures they had, so it was for the best if more enlightened peoples took care of things —sort of an archaeological version of "the White Man's Burden." ...[The King] is always increasing his taste for matters of antiquity, which he loves with the zeal of the most passionate antiquary, for he not only makes all the necessary trials and inquiries in these cities which have been covered by Mt. Vesuvius, but extends his researches into other parts of his kingdom...our miners have become with time more perfect [and] none can execute better. By his own words, he filled room after room in the Royal Museum at Portici with artifacts and cataloged them carefully. I don't know that there is a conclusion to be drawn other than that good archaeology is something that had be learned. Certainly, the study of antiquity is forever indebted to Weber and Winckelmann, but it would be a mistake to think that Charles III was a "casual ransacker" of his own kingdom. He was (and still is) widely regarded as an intelligent and capable king interested in turning Naples into a true capital city of a kingdom. That is why he built the San Carlo theater, for example, not because he liked opera (he didn't), but rather because a capital city should have a fine theater. He went in for large, stately architecture, as well, which is why he chose Vanvitelli and Fuga to build his new city. Presumably, that is also why he installed a Royal Museum in the palace at Portici; that is, because a great kingdom should have a good museum to display these newly found objects of antiquity. That is, admittedly, not modern archeology, but it is careful and methodical for its time. Borstin, Daniel J. The Discoverers. Random House, New York, 1983. Parslow, Christopher C. Rediscovering Antiquity : Karl Weber And The Excavation Of Herculaneum, Pompeii, And Stabiae. Cambridge University Press. 1998. Ramage, Nancy H."Goods, Graves, and Scholars: 18th-Century Archaeologists in Britain and Italy" in American Journal of Archaeology, Vol. 96, No. 4 (Oct., 1992), pp. 653-661. Stiebing, William H. Uncovering the Past. Oxford University Press. 1993.